This series is commissioned by UPS. Discover the new logistics. It levels playing fields and lets you act locally or globally. It’s for the individual entrepreneur, the small business, or the large company. Put the new logistics to work for you. While U.S. consumption may be slowing, and exports aren’t exactly surging, trade at the nation’s ports is showing a robust rebound.The port of Los Angeles, the key access point for Asian good heading into America, had a 22% increase in shipments year-over-year in September. 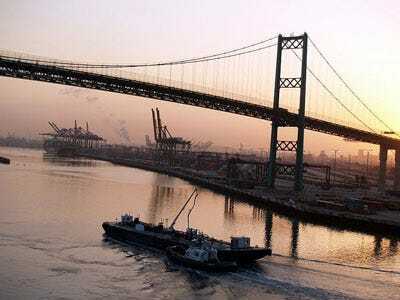 The other big California port, Long Beach, surged 30.5% year-over-year in September. Now volume was down a little from August, but that’s still substantial and steady growth. Things are going so well at both ports that they have kicked off night and weekend shifts again. And it’s not just Californian ports, key for Asian shipping surging. New Orleans is currently seeing record container shipments into its port. This rebound might be soon be in decline, however. Traffic has fallen in Asia, with the largest nine ports experiencing a 6% fall. That could eventually mean a slowdown in U.S. traffic.